Gone are the good old days of open windows and unlocked doors. These days security has become more of a necessity rather than a luxury and luckily here at Wanneroo Glass we can help! We can supply and fit security doors and screens in a range of colours and styles to suit your individual needs. Fibreglass or Aluminium Mesh are the most common types and are found in most residential fly screens. 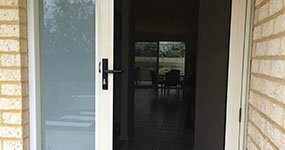 All fly screens and fly doors ordered through Wanneroo Glass come standard with fibreglass mesh but can be upgraded to any of the below types if requested. Tuff-Mesh is a heavy duty flywire so it’s stronger and more resilient to accidental damage. Pet-Mesh is stronger again and is generally used when you have cats or small dogs that like to scratch at the door. Micro-Mesh is basically fibreglass mesh that has been weaved closer together creating smaller gaps between the wires. This type of mesh is ideal for areas where midgees or small insects are common and regular mesh only keeps out the larger pests like flies. One-Way Restricted Vision is manufactured from aluminium in a way that makes it see through from one side and appear almost like a solid panel from the other. This mesh is most commonly found in front doors but can also be fitted to windows making it ideal for extra privacy when the blinds are open. Colours not listed are available for a small additional fee. Wanneroo Glass support the local community. We are proud sponsors of Joondalup City Football Club & North Beach Soccer Club.